SCRIPT: Technology Now, I'm Kate Brookes. Every year home electrical fires cause nearly five-hundred deaths and over a billion-dollars in property damage. That's why Siemens' Kevin Yates says it's important to know the latest technologies designed to protect property and save lives. CUT: (Yates) There have been some great advancements in technology over the past several years. One such device would be a combo AFCI which essentially can help prevent a fire from an unseen arc or sparking issue behind the walls of your home. SCRIPT: Yates also suggests that lightning may be causing a problem for your home's pelectrical system. CUT: (Yates) The way you can take a precaution is either at the wall outlet put in a surge protection device, or if you want to take the maximum protection for your home – install a surge protection device in your load center that protects your entire home from a surge of power from a lightning strike. SCRIPT: For more, log onto USA-dot-Siemens-dot-com-slash-whole-house-safety. 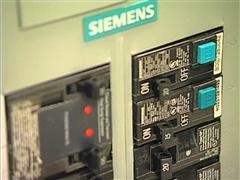 That's Technology Now from Siemens.